Q4 is flying by, isn’t it? Your sales team likely needs a wee bit of motivation this time of year to meet their revenue objectives. If you’re looking for clever ways to rev up your sales engine, look no further than your RFP response process. To improve your win rate and meet your sales goals efficiently, RFP response automation is where it’s at. As a salesperson who does double-duty as an RFP responder, time is a commodity. On average companies invest up to 40 hours into every RFP response and the RFP close rate is around 5%. Understandably, you start thinking about greener pastures. The thing is, RFPs can be that revenue generator you’re looking for if you refocus your strategy. According to Salesforce and McKinsey Global Institute, 40% of tasks within the traditional sales function can now be automated. With RFP software, you can automate the following strategies to help you respond faster to business opportunities, beat the competition, and achieve your sales goals. Sounds amazing, right? That’s because it is. When RFPs are coming at you from every direction, you have to prioritize to meet tight deadlines. You already know about the time investment that will be involved. Focusing on proposals with higher chances of winning is a smart approach. According to the Standish group, small projects have a 70% higher chance of performing better than large projects. RFPs from that ungettable enterprise company is enchanting, of course, but stiff competition accompanies that enchantment. Mid-sized business RFPs might be a better fit for your organization, and they too can have a positive impact on your sales numbers. Collaboration cannot be undermined in RFP response—it’s necessary every time. Considering the fact that an average professional receives about 100 emails each day, using emails alone as a collaboration tool won’t cut it. Something is bound to get missed since only 24% of sales emails get opened anyway. It’s time to automate. Speed and accuracy are the weapons needed for winning RFPs. As soon as you receive an RFP, RFPIO makes it easy to get started with project collaboration. The import function brings in any document format from the issuer, be it a spreadsheet, document, or PDF. You or your proposal manager quickly assign questions and sections to SMEs. Communication happens with alerts through a dedicated Slack channel, through the platform, or through Salesforce—less email means fewer tasks slip through the cracks. The review cycle runs smoothly with sequential reviewing, ensuring the best possible deliverable is pulled together in an orderly fashion. The beautiful finale happens when you export back into the source document or a branded template of your choosing, without a bunch of reformatting and sleepless nights. You deliver a quality RFP on time…and you’re off to the next one. Gartner points out that most clients spend 45% of their time searching for possible alternatives, both offline and online, before reaching out to sales. Personalization is the secret to success with any content. Personalizing your RFP responses helps you one-up your competition, who is probably over there recycling the same old boilerplates as they rush to meet the deadline. Coaching your sales representatives on how to leverage technology to create personalized RFP responses can really help here. Sales teams that undergo at least three hours of training or coaching every month surpass their targets by 7% and increase their win rate by 70%. A strong team, personalized messaging, and technology powers equals winning at RFPs. RFP software automates the entire content creation process, freeing up your time to keep the focus on personalization. 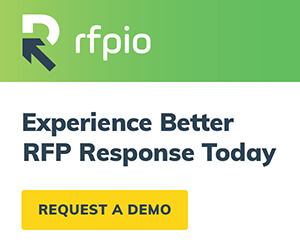 With RFP response automation, your team spends more time customizing and polishing RFP responses. Since most of the legwork is already taken care of, quality improvement is the main focus. Auto-response fills in the majority of the questions up front with the help of AI, which grows smarter the more you use the application. Search is another way to find content quickly, without the need for a Google Drive folder expedition. Rating and tagging make top content accessible for anyone to grab and include in their RFP responses. Content audit reminders can be set up at a cadence of your choosing, reminding proposal leads to refresh outdated information and rid the answer library of unnecessary duplicates. There is little training needed for a solution like RFPIO, which is incredibly user-friendly. Team members across departments can start using the solution for an RFP project right after onboarding. This ease promotes a collaborative environment since multiple users can work together in a centralized platform, regardless if they are in the same office or on a different continent. You just lost a huge request for proposal…now what? Read this. Demand Gen revealed that you gain a 20% increase in sales opportunities from cultivated leads. Only 2% of deals are successful during the first meeting. Also, 84% of customers start their RFP process with a referral and peer recommendations influence about 90% of buying decisions. Sales is a bit of a battlefield, isn’t it? You’re not alone in feeling this way. What it really comes down to is maximizing the hours you have in a day to get the most results. Though RFPs might not seem like the easiest avenue for achieving sales, every RFP is, in fact, a business opportunity. It turns out that 45% of sales teams report excessive administration duties like manual data entry as one of their main challenges. When you have a manual RFP response process, it’s like you’re on that battlefield with a blindfold AND your hands tied behind your back. So, a good look at your process is worth it. Repetition is part of the RFP cycle, whether you’re responding to an RFI or a security questionnaire. RFPIO’s features help in multiple use cases, including security questionnaires where bulk answering and the same import/export functionality are available. The project overview dashboard gives insight into the progress, status, and contributors. You can feel good about where everything’s at without spending time tracking people down for updates. With the time you gain from automating these processes, you can respond to more RFPs. By responding to more RFPs, you increase your win potential and achieve your sales goals. Automating repetitive tasks allows you to focus more on other sales generating activities. Automation also means you can really fine-tune the RFP for your prospect as you’ll have more time to pay attention to the requirements, versus whizzing through various questions and missing important details. A motivated and productive sales team plays a big role in bringing in new business through RFPs. Successful RFP management is all about using technology to automate processes for efficiency. RFP response automation will empower your team to reach their sales goals.